Decorating for Halloween or Fall with carved, drilled, Sharpied or painted pumpkins....these pumpkin ideas will for sure be the focal point of your Halloween decorations and/or harvest displays. Use an assortment of looks to achieve a front porch vignette that feels collected yet coordinated like here, where gold and chalkboard paints are used to add texture and dimension to six plump, squatty, and playful pumpkins. Create your own "gourd"-geous no-carve pumpkins by incorporating two traditional office supplies ~ thumb tacks and a permanent marker. 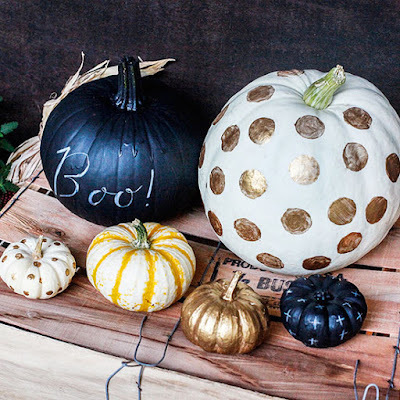 For one, grab a black permanent marker and add a weblike chevron pattern to a white painted pumpkin. 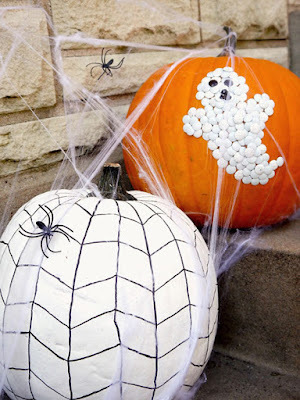 For the second, push white thumbtacks into an orange pumpkin in the shape of a ghost. Black thumbtacks provide his eerie eyes and mouth. Quotes are a huge trend this year! 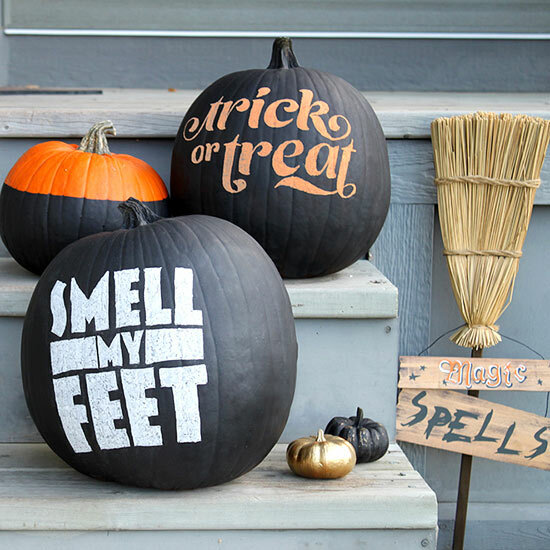 Pumpkins can even get in on the trend...to get the look of these wordy Halloween pumpkins, paint your gourds with chalkboard paint and trace on your words using stencils. Remove the stencils, then fill in the letters with traditional white or colored chalk. 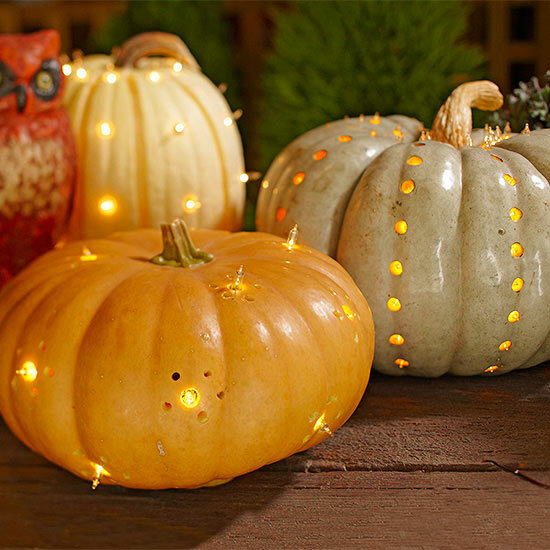 Give your porch a ghostly glow with a trio of shining pumpkins using any kind of pumpkin in different colors and sizes. 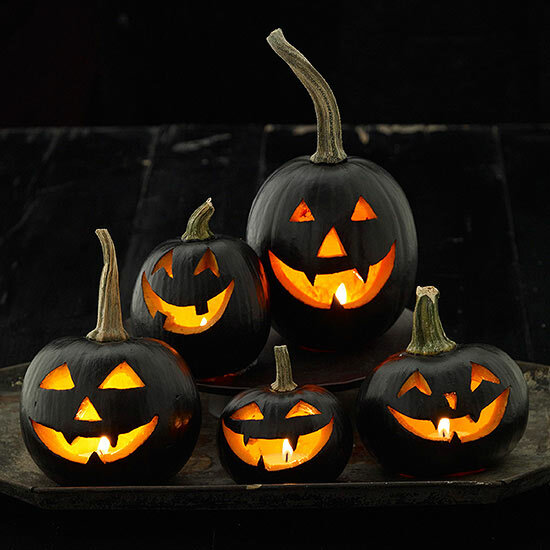 Hollow out each pumpkin, making sure to scrape the sides smooth, then use a drill and a small bit to create different patterns of holes that will snugly fit the string lights. Lastly, create a larger hole in the back so you can connect the cords to power. This grinning jack-o'-lantern family is done by simply painting your jack-o'-lantern with black acrylic or spray paint before carving. TIP: Make sure to use painter's tape around the stems to keep them paint-free. 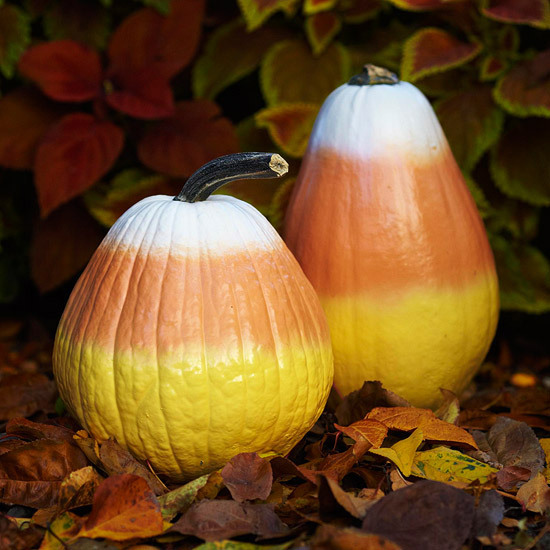 Try out these colorful no-carve candy corn pumpkins by choosing cone-shape pumpkins. Clean the surfaces of your pumpkins and then spray-paint the pumpkins, to achieve the candy corn look, taping off as you go up. 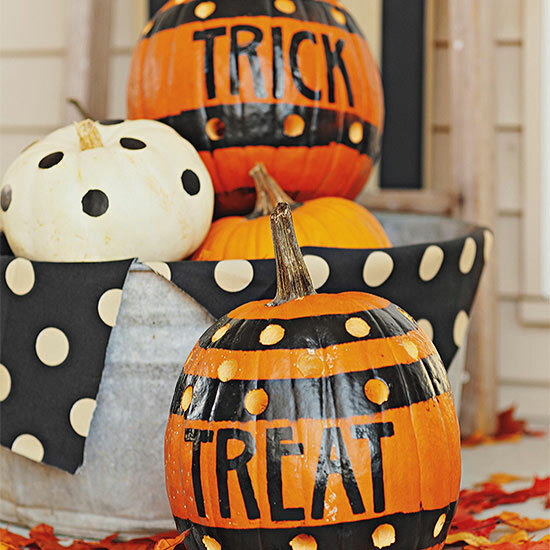 Create a strikingly sweet pumpkin grouping with a little masking tape, spray paint, and a drill. For this display, use the tape to outline stripes and cover the parts you'd like to remain orange, then spray-paint black. Let dry completely, then remove the tape to reveal your design. 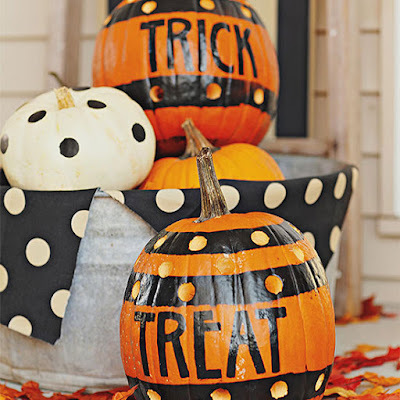 You can use a permanent marker to adorn each pumpkin with your favorite Halloween saying, drill holes along the black stripes for light to flicker through, and arrange in a vintage metal washtub for a rustic feel. Shine bright this Halloween with a metallic pumpkins. First you will collect fallen leaves and spray-paint them gold, let dry. Paint one pumpkin white and the other gold. 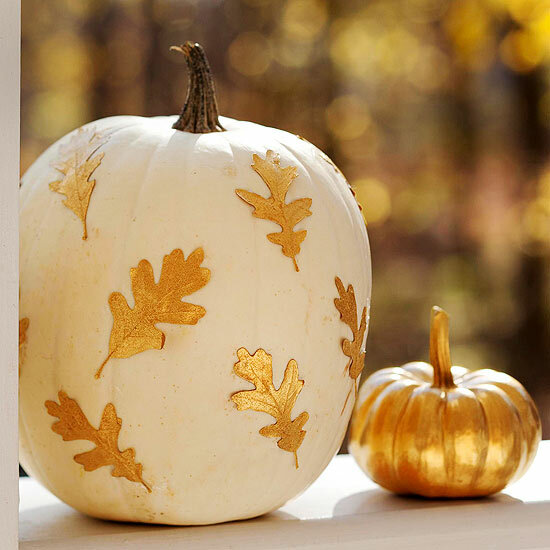 When dry, use crafts glue to attach the metallic leaves to the white pumpkin. Create these crawling critters by orange or white medium-size round pumpkins. 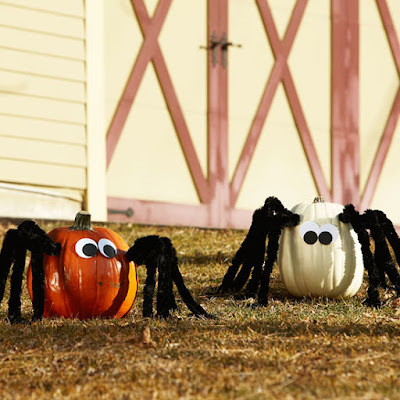 Make four holes in each side of the pumpkin with a drill bit and attach jumbo black chenille piper cleaners to create the spider legs. Use adhesive glue dots usually found in the scrapbook section, to connect white and black craft foam circles for spider eyes.